Wild Gooseberry (Ribes divaricatum) -– Contraction around a situation feeds fear while expanding your energy to embrace a situation allows fear to transform. Let fear melt away and arise to a new life! I AM transforming fear into engaging life! Wild Gooseberry, also know as gummy gooseberry, is a US Pacific NW native deciduous perennial shrub that grows 3-8 feet tall and has thorns at the leaf nodes. It grows best in moist to dry forest edges with partial shade. Maroon and white fuchsia-like flowers provide a valuable food source for hummingbirds. Gooseberries are edible for humans and wildlife. Unable to move forward in life because you are contracted or paralyzed by fear. Lacking confidence to engage new opportunities. Wild Gooseberry Flower Essence helps you stay open and engaged while facing fear. This could be a current situation or old fear that is locked into your body/being. Intense feelings can propel you forward; however, it's common instead to contract around the intensity of fear. 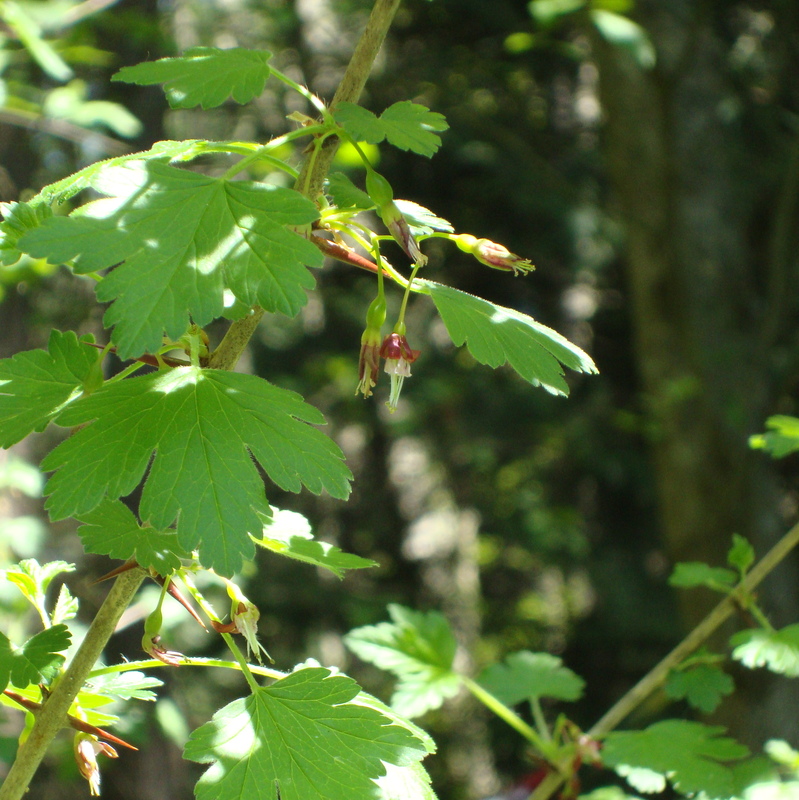 Wild Gooseberry Essence helps you stay open to what feels intense and experience that new growth, new life can arise from the compost of fear. It instills confidence to participate in new opportunities. Wild Gooseberry flower essence was made with the “no-pick” method of bringing the frequency of the plant spirit directly into the mother/storage bottles as they are sitting with the plant. During this process, amber, aquamarine, bloodstone, drusy quartz, icosahedron cut quartz, Inca (Lemurian) jade, malachite, moonstone (white), and red jasper crystals were placed among the plants with the storage (mother) bottles. The sun acts as a transformer to step down spiritual energies from higher dimensions. While the essence was being made, Amber acted as a lens to receive and focus sunlight for this purpose. It also aligns the subtle bodies with the physical bodies, transmutes negative energy into positive energy, and emits a sunny and soothing energy that calms and enlivens the disposition. Aquamarine calms fear, hysteria and grief, and releases attachment to old ways of being. Drusy quartz crystals help to energize and stabilize your subtle bodies. Bloodstone is a stone of courage that helps you to recognize the beneficial aspects of turmoil before balance. It rebalances your base, sacral, navel and heart chakras, energy fields, and total body during the realignment of these energies. Icosahedron Cut Quartz has 20 (5X4) equilateral sides. It is a bridge between the 5th Dimension - the entry into the unified Spiritual realms - and the 4 cardinal directions (N, S, E, W) on Earth. Inca (Lemurian) jade soothes and heals your emotional heart center, and strengthens the physical and energetic bodies. It encourages you to delight in life, this time of being Spirit in the world of matter. Malachite is a powerful stone of protection, clarity and confidence. It restores strength and vitality by clearing and stimulating the flow of life force in the physical, emotional, mental and spiritual subtle bodies. Moonstone (white) instills calm and awareness. It helps you sort your emotions to see how they serve your higher purpose. Red Jasper instills physical vitality, emotional balance and zest for life. The actions of the crystals inform the way this flower essence seats into the physical body. While the Wild Gooseberry flower essence was being made, imprints of rattle and blue jay were infused into the essence.